I owned my Vespa motorscooter from 1975 to 1981. I bought it new for about $1,000 and put 25,000 miles on it in six years. I had fun with it and hardly had any trouble with it. It only had one piston so I had to put three sets of rings on it during that time, but I did the work myself. It was easy to work on. 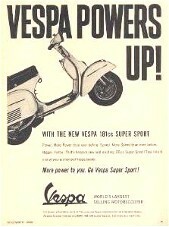 I had my first introduction to a Vespa motorscooter in 1969 when my younger brother got one. It was a Vespa 125 cc. It had some get up and go but was not legal to drive on the freeways in California. It didn't look like much but it had quite a bit of torque. It had a 2 stroke engine and got great gas mileage. That summer I bought a Suzuki 150 cc. motorcycle. It had looks and speed. It was a relatively small bike and I could cruise it at 50 miles per hour real easy. I liked the fact that it was light and not a real heavy bike. Then my brother and I went up Kelly Road (a logging road) west of Cloverdale that had very little traffic. He took his Vespa and I took my Suzuki. There was a near verticle hill on the side of the road that was very steep. I tried to go up it with my street bike (my Suzuki) but my bike wouldn't pull it. Then my brother tried it with his Vespa and made it. His little Vespa had out-performed my Suzuki. I was amazed at it's performance. My brother and I studied it to find out why. It had great torque, had the weight in back, it had a low center of gravity, and had direct drive between the transmission and the engine (it did not have a sprocket and chain). It was just a tough dependable little machine. Then me and my bro drove up the California coast highway on our cycles. We rode side by side for mile after mile but then we went single file on the winding curvy roads. We got to lean way over on the curves which was a lot of fun. We camped overnight in the woods west of Willits. The next day we rode some more and came back home. 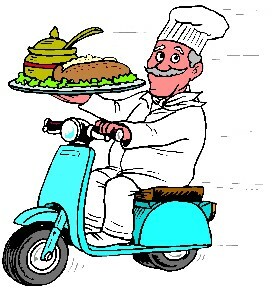 His little Vespa purred like a kitten the entire way. My Suzuki also did a great job but I had to be careful not to get my pant's cuff caught in the engine chain. 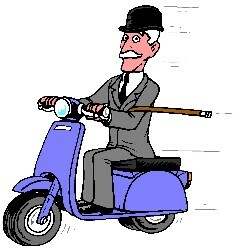 I started developing a respect for Vespa motorscooters. But my brother didn't want to keep it because he wanted to buy a car. So he sold it to some of the neighbor boys and they had fun with it for a long time. I rode my Suzuki all over Northern California and took it to Santa Cruz with me when I went to Bible College there. Then I started having trouble with it. I blew the seals out of the engine and had to have them fixed. Then one day I was on a 50 mile journey when the back sprocket flew off of it while I was driving. I had to look thru the weeds in the ditch on the side of the highway for the parts that had flown off. Fortunately, I found them and put them back on but developed a bad taste for a chain and sprocket machine. So I promised myself that I would never own another chain and sprocket machine and I never did. Later, I traded my Suzuki for a 1951 Chevy half ton pickup (plus an extra engine) to the neighbor who lived down the street. Then in 1974 I worked a construction job and saved my money. I was a pipeline painting foreman and was responsible for 5 men and two trucks but it was basically a seasonal job. 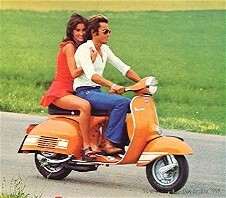 With my money I bought a brand new Vespa in 1975. It was the ideal machine for me. It was a 200 cc (the one with the big engine) with 18 horse power so it was freeway legal in Calif. It had a glove box to keep little items in. It had a spare tire. It got great mileage and I could cruise it at 70 miles per hour if I wanted to. I liked it's look- it was different and distinctive, just like me... It had a two cycle engine with fewer moving parts. That meant that there were fewer parts to break in the engine. 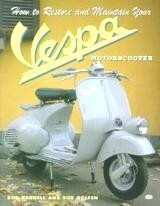 My Vespa was also air cooled. Nearly everyone knows that air cooled is better than water cooled. The allies learned this lesson real early in World War Two when the air cooled German tanks in North Africa ran circles around their water cooled tanks. Some of the BMW motorcycles from the 1975 time period had air cooled engines with opposed cylinders. Some had a drive shaft instead of a chain and sprocket. They were direct drive. It was a quiet bike so to speak and very dependable. I talked to one such owner one time who just loved his bike. 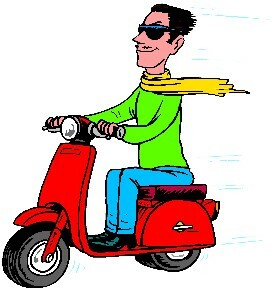 My Vespa had a manual transmission which, in my opinion, is better than an automatic one. If I had a hard time getting it started any other way I could always push it, pop the clutch, and get it started that way. I never wore out a clutch plate even though I bought an extra one just in case. It had direct drive with no sprocket and chain. I hate a sprocket and chain or a rubber belt and pulley. In my opinion, you are just asking for trouble if you buy a machine that has a set-up like that. It had a low center of gravity that helped me keep it upright. This also helped me in the dirt. I could take the back tire off of it (the street tire) and put on a nobby tire and take it to the dirt. With it's high torque it could really climb and that nobby tire really helped it dig in to get up some pretty steep hills. It was easy to go shopping with it. I had bought a special rack that mounted on the back of it to hold cargo. All I had to do was to strap the cargo to it real good. It was great to ride a passenger in back of me. The person could hold onto me and fit his or her feet easily onto the floorboards. We could lean together into the curves for easier handling. It was light enough that I could control it on the street or in the dirt with ease. I hate a heavy motorcycle where there is always the danger of the thing falling over while at rest. And then it is always so heavy that it takes two people to lift the thing back up again once it falls over. That takes the fun out of it. 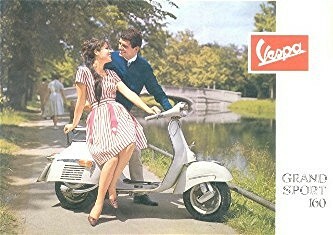 So for me, that Vespa was just the perfect weight for me. Security was no problem. The steering wheel locked. Plus I mounted two extra eye bolts on the front of it to which I padlocked a chain that I carried in the glove box. Well, the opportunity came for me to put it to the test. I got laid off (because of lack of work) in the Spring of 1975 where I was driving a fork lift at a local winery. I decided to drive my Vespa from California to Texas so I could see both of my grandmothers and work on my hobby of tracing my family tree. It was a long trip. I put 6,000 miles on it in 6 weeks. It performed just great and I was delighted with it. I saved a fortune on gasoline because it really got great mileage. I got tired of sitting on it and some folks in Texas were skeptical that I had really come on it all the way from Calif. so they had to look at my Calif. license plate for proof. I enjoyed that. I created some fond memories for myself with my Vespa. In 1980 I placed a young lady on the back of it and took her up into the mountains west of Cloverdale. I sat her down on a large rock with a view overlooking a beautiful valley. 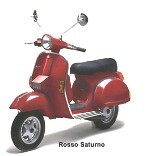 I took a rose out of the Vespa's glove box. I put the flower in my mouth and got down (on one knee) in front of her and asked her to marry me. Guess what- she said yes.